I am totally not the slacker you think I am. I’m not. Well, maybe just a little, but I have reasons, explanations, justifications excuses. I am fully aware of how far behind I am on reading everyone’s posts and I feel so bad that I am not commenting as much as I usually do. I have truly been trying to get my unread posts down to zero so that I can resume my usual commenting process, but three weekends in a row without the internet has left me speechless (read: commentless…yes, this is a word but you won’t see Merriam Webster acknowledging it yet as they are farther behind than I am in my Reader). On Wednesday I tried to leave several comments from my work computer (quite humorous ones at that!) and Google Blogger was being a giant asshat. When I got home I still couldn’t comment. I was able to write a post and add pictures, but when I hit ‘Publish’? Same asshattedness (yes, this is also a real word, but as I stated above, good ole M. Webster is a bigger slacker than me). After restarting my computer, at Lou’s suggestion it did finally comply. But I’m still left with that gnawing feeling that I have things left on my plate…and that does not make me a member of the clean plate club, gosh darn it! Therefore, because I feel so overwhelmed, instead of taking the time to write a post I am taking an intermission until Monday and am posting a picture I took of my grandson recently. Feel free to ooh and ahh. As a postscript I’d like to thank Mike for his comment yesterday proclaiming his love of warm zucchini bread and peanut butter. I tried it and it is really good, so good that I made it my dinner last night. He is quite the looker. Big expressive eyes. Enjoy your weekend. He's so adorable, those eyes are mesmerizing! And where have you been?!? No, just kidding. I know it's hard to keep up and the LAST thing you should do is beat yourself up for it. enough already, girlfriend! I still love you! What a cutie pie! I just love his face! I am reminded of something my Gramps used to say, and I have frequently repeated - The hurrieder I go, the behinder I get. Oooooooh! Ahhhhhhh! Very cute, but then again, he comes from some very lovely genes. He is gorgeous! You really should just Mark All As Read and move on. It's okay, really, and I've had to do it when I get too far behind. I'm a must read every post person, too, and that's why I have such a small blogroll, but do yourself a favor and just start fresh. Otherwise, you end up like me, spending all your time reading and commenting and completely neglecting your own blog. Darlin', don't ever worry about it. I can't tell you how many times I have hit "Mark All As Read" in the reader when I get behind. Like Lola said, the "Mark All As Read" button is there for a reason. Don't be afraid to use it. I'm glad you liked the zucchini with peanut butter! My mouth is watering just thinking about it. 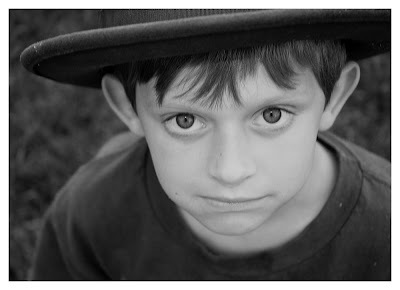 It reminds me of a 'child actor' pic, from an old movie or tv show. Little Rascals came to mind immediately when I saw it lol. Fine looking young lad...love b&w's. What a good looking guy! Great photo of him! Now off to find me some of that zuccini bread!